Destruction of the Royal Library of Alexandria: One Theory Dramatized in the Film "Agora"
As part of my ongoing project, From Cave Paintings to the Internet, I recently wrote this post concerning one possible explanation for the destruction of the Royal Library of Alexandria. The actual cause or causes of the destruction of the greatest library in the ancient world remain unknown, but subject to "informed speculation." One theory suggests that in 391 CE what remained of the Alexandrian Library was held in the Serapeum of Alexandria, a temple built by Ptolemy III and dedicated to Serapis, the syncretic Hellenistic-Egyptian god who was made the protector of Alexandria. According to the the monk historian and theologian Tyrannius Rufinus and the historian of the Christian church Salminius Hermias Sozomenus (Sozomen), Theophilus of Alexandria, Patriarch of Alexandria, discovered a hidden pagan temple. He and his followers mockingly displayed the pagan artifacts to the public which offended the pagans enough to provoke an attack on the Christians. The Christian faction counter-attacked, forcing the pagans to retreat to the Serapeum, which at that time may have housed what remained of the Alexandrian Library. In response to this conflict the emperor sent Theophilus a letter ordering that the offending pagans be pardoned, but giving permission to destroy the temple and its pagan contents. According to church historian Socrates Scholasticus, the emperor granted permission to destroy the temple in response to heavy solicitation by Theophilus. “ 'Seizing this opportunity, Theophilus exerted himself to the utmost ... he caused the Mithraeum to be cleaned out... Then he destroyed the Serapeum... and he had the phalli of Priapus carried through the midst of the forum. ... the heathen temples... were therefore razed to the ground, and the images of their gods molten into pots and other convenient utensils for the use of the Alexandrian church' —Socrates Scholasticus, The Ecclesiastical History" (Wikipedia article on Theophilus of Alexandria, accessed 11-28-2010). 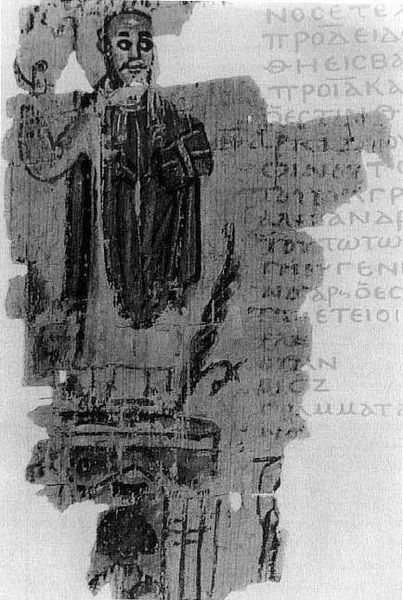 ♦ A papyrus fragment from an illustrated Greek chronicle written in Alexandria circa 450 CE has survived, depicting Theophilus standing triumphantly on top of the Serapeum, providing a near contemporary portrait of Theophilus in the context of these events. In 2009 Spanish film director Alejandro Amenábar released the historical fiction film Agora based on elements of these historical events, and the life of the female Neoplatonic philosopher and mathematician Hypatia (portrayed byRachel Weisz), who was the daughter of the last known mathematician associated with Alexandria, Theon of Alexandria (portrayed by Michael Lonsdale). In my opinion this is among the few historical films to include discussion of serious, if watered-down scientific and philosophical ideas along with all the action sequences. The drama seems relatively objective, presenting the tragedy of the deaths of Hypatia and Theon, and the loss of the Alexandrian Library against unbiased and unflattering portrayals of the conflicts between pagans and Christians, and the conflicts between Christians and Jews. Though inevitably the screenplay took historical liberties, from the standpoint of book history the film seems reasonably accurate, with the exception of two details: in one scene a Christian is shown preaching from a papyrus roll. More than likely this would have been a codex; in another scene a Christian preacher is appropriately shown with an open codex written in what resembles appropriate Greek majuscule. The other probably inaccurate detail is the way that the rolls are shelved in the Serapeum. Instead of pigeon hole shelves which probably would have been historically accurate, the rolls are displayed in shelves with diagonal cross-pieces rather like those used in some wine cellars. The film was a critical success but commercial flop in the U.S.; it was financially successful in Europe, and released on DVD in 2010. For a detailed historical critique of the film see Agora: the "Reel" vs. the "Real" Hypatia, parts 1-3 at Faith L. Justice's Historian's Notebook blog. I saw Agora when it first came out in NYC and loved Weisz' performance as Hypatia. The film was beautifully shot and a bit uneven. Amenabar did distort some history in service to his art, but that's what artists do. I go to the movies for entertainment, not accurate history or science. For people who want to know more about the historical Hypatia, I highly recommend a very readable biography Hypatia of Alexandria by Maria Dzielska (Harvard University Press, 1995). I also have a series of posts on the historical events and characters in the film at my blog - not a movie review, just a "reel vs. real" discussion. Historical resources can be taken from the library by students. Sam Houston State University access allows to take chance and editing essay writing help within the 2 weeks before exams. The old letters are saved in pdf files. The a little cheap feel to it is frustrating overall respectable value visit the following site An easy to activate time out button in instance you require it.